If you're not tuned into the current World Cup semi-final game between Brazil and Germany, take this as your cue to turn it on, or at least follow a liveblog of it on BBC . The Germany-Brazil game is absolutely crazy , with Germany in the lead by five points while Brazil...well, Brazil has zero points. Oh, and this all happened within the first half of the game, which is a real rarity when it comes to football/soccer — and it's even worse when you consider Brazil's reputation as a team, and also the fact that the World Cup is taking place in their home country. 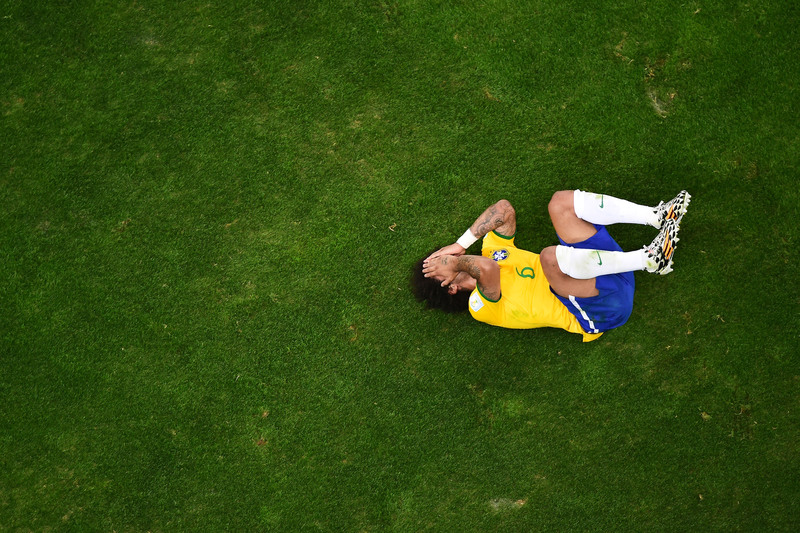 As one announcer put it during the game: "It’s almost as if Brazil have stopped playing." Yikes. Of course, the reaction from Brazil fans has been tremendous — well, in the sense that people are sobbing and screaming at the stadium. Considering the fact that the game still has a good amount of time left (and Germany managed to score five points in the first half with seemingly no effort), there's no telling how the rest of this game will go — there will probably be many more images like this to come.